With industry-leading 5.0 cu. 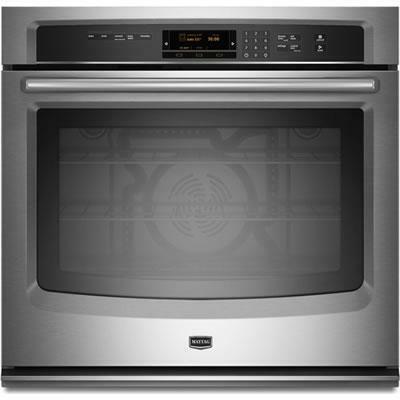 ft. capacity* and a 10-year limited parts warranty on the elements, this built-in 30" oven is made to last. Easily check on advanced features like 8-minute Power Preheat or EvenAir™ true convection using the 4.3" LCD screen. The innovative FIT system ensures your beautiful new oven will install in your existing opening without any cutting or extra wood trim, while the panoramic view window offers a large viewing area. Additional Information Power Preheat your oven in 8 minutes; Delay-Start oven control; Precision Cooking™ System with Precise Preheat, PreciseBake and Precision Cooking™ system with Precise Preheat, Precise Bake and Precise Broil; Variable Broil; Standard Oven Racks: 2; Keep Warm™ Oven Setting; EvenAir™ True Convection with Third Element and Auto Conversion; FIT System offering Streamlined Installation; Panoramic View Oven Window; Heavy Duty Roll-Out Rack; 4.3" LCD Touchscreen Oven Control; Self-Cleaning Oven with Adjustable Cleaning Levels; Hidden Bake Element; Cabinet Installation; Undercounter Installation. Additional Dimensions Cutout Depth : 24"; Cutout Height : 28"; Cutout Width : 28 1/2" Interior Depth (in.) : 19"; Interior Height (in.) : 18"; Interior Width (in.) : 25".